Zeph (pronouns they/them/their) is a queer visual artist and organizer dedicated to storytelling, the public realm, and the power of real bodies in real space to build cultures of resistance. From 2007-2010 Zeph worked as a researcher, illustrator and presenter with the Beehive Design Collective’s True Cost of Coal campaign, an intricate portable mural and workshop developed in collaboration with Appalachian grassroots organizations that has traveled to hundreds of cities in the US and internationally. Since 2011, Zeph has focused on creative responses to the Bay Area’s economic and housing crisis. Their drawings, prints, and interactive installations focus on resilience in the face of personal and collective loss. 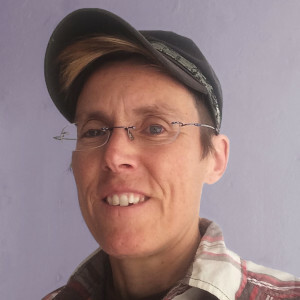 Zeph has also produced props and organized art builds for theatrical street interventions in collaboration with grassroots groups like Heart of the City Collective (Leslie Dreyer), Eviction Free SF, the Anti-Displacement Coalition and in solidarity with the Black Lives Matter movement. Zeph also helped sustain two artist spaces that served as art/activist hubs—Million Fishes Collective in San Francisco (evicted 2012) and Lobot Gallery in West Oakland (freshly evicted).